After several teases, The Flash finally gives audiences a proper look at the mysterious Zoom and shows him to be a villain that is not to be taken lightly. This episode actually reminded me a lot of “Rogue Air” in that the expectations for the episode were for the conflict with the villain but the majority of it was focused on something else. The major difference here is that the different focus was more connected to the villain conflict than it was in “Rogue Air”. Everything in this episode was about luring Zoom into a trap as opposed to keeping the captured metahumans safe from Wells. Much of this episode was devoted to readying Earth-1 Linda Park for the deception that would lure Zoom into the trap set by Team Flash. It wasn’t a bad set-up as it allowed the bulk of the episode to be light and fun while the characters got to play off each other in different ways. The strength of this show has always been the characters so any opportunity to allow them the chance to have meaningful development is always going to be welcomed. After Dr. Light escapes using the power of invisibility it’s down to Linda to pose as her Earth-2 counterpart in order to trick Zoom. This naturally leaves Linda terrified as she has real trouble processing what is going on before this request is made. It is a big deal to see someone who looks like you murder someone you work close with and I’m glad the episode doesn’t gloss over that. Linda is a normal person with limited exposure to these sorts of problems so the fact that it completely blows her mind completely makes sense. Having her be terrified of what might happen to her is another reasonable reaction. She is smart enough to know that Barry’s plan puts her in very real danger so it’s only natural that this would scare her. The fact that she goes along with the plan says a lot about her as well. She hasn’t been in the show much but she definitely comes across as a confident and driven person. This definitely comes across here as she is willing to put herself at risk to help the Flash bring down a horrible villain. She has that level of trust in Central City’s hero to the degree that she is willing to put herself on the line to help him out. I loved the training scene where she has to focus her fire only on the cardboard cutouts of the Flash. It was a really silly scene but allowed for some fun character beats. Cisco’s different poses for his cardboard cutouts were all priceless and Joe’s reaction to seeing these cutouts was really funny as well. When this show tries to have fun it’s infectious. Barry revealing his identity to Linda is something that didn’t really work for me. The sentiment was fine in promoting mutual trust between them but I don’t think he should be so cavalier with his secret to people he doesn’t know all that well. Iris would have a right to be annoyed that it took him so long to admit the truth to her when he casually unmasks in front of Linda after knowing her for a fraction of the time he has known Iris. It’s a very small thing and there’s a hint that she might not be able to handle the secret but it wasn’t really necessary. The fake fight between Linda and Barry was a lot of fun as well though having it open the episode pretending as if it was real didn’t work at establishing tension. It wasn’t something that needed to be returned to and no suspense was built at all. Both of them were speaking in clunky old school comic book dialogue which causes even Cisco to wince. It was really funny to watch but as a legitimate plan to lure Zoom there’s no way it could work. It seemed too hammy to be convincing to anyone so it’s no wonder that Zoom didn’t fall for it. The whole thing screamed trap as well so even if it had worked I don’t think it would have taken much for Zoom to scope out the area to find Harry and Joe with their sniper rifles. Harry’s motivation becomes known to Team Flash after the audience finding out last week. There are flashback scenes set in Earth-2 that show his relationship with his daughter Jesse (Violett Beane) -who apparently will be this show’s version of Jesse Quick– and the circumstances around her kidnapping. I don’t think these were completely necessary as the fact that he cares about his daughter is implicit but it does allow audiences to see what sort of person Jesse is. She doesn’t have blind respect for her father and openly disagrees with him so that should give their relationship an edge. I’m not sure why Harry didn’t simply tell Team Flash that he needed their help to save his daughter. It would have prevented some of the mistrust that they are feeling and actually motivated them to want to help him out. It shouldn’t take Cisco to “vibe” him for that information to come out. I liked the Earth-2 scenes because they let us see more of Earth-2. The design is really cool and the little hints at the differences are always fun. It was a nice touch to show that Robert Queen is the Arrow with Oliver dying at sea. I hope that they actually show this version of the Arrow at some point but judging by the news report it doesn’t seem to be going so well for him. There is some exploration of Barry’s motivation to stop Zoom through Joe. He thinks that Barry is only so driven to stop Zoom because he never actually got the chance to stop Reverse Flash. He wasn’t the one to bring him down so there could be some unresolved revenge desire there. Barry insists that this is not the case and relates it back to the video message from Wells in the first episode of the season. Wells said that Barry would never be happy no matter how well his life seems to be going and that’s something that has stuck with him. He isn’t sure if Wells is right or not and the uncertainty is causing him to behave somewhat irrationally. Part of his motivation is noble as any metahuman that Zoom sends after him puts innocent people in danger and, above all, saving innocents is what Barry is all about. Joe acknowledges that but becomes the voice of reason as usual and encourages Barry to go after what makes him happy and not to stress about what Wells said. This causes him to decide to really make a go of it with Patty. There’s not much to say about their relationship in this episode other than it already feels more natural than Barry and Linda ever did. They are a good fit and it is progressing slowly enough to feel real. Patty is establishing herself as having a lot more to her than being a love interest for Barry. She is smart enough to know when Joe is hiding things from her and calls him on it. Joe doesn’t let her manipulate him which creates a really fun dynamic between the two of them. Patty’s depth is a big part of why she works so well in this show. Zoom’s full introduction really leaves an impression. The fight him and Barry is brief but very impactful. Barry is clearly no match for his superior speed as shown when he literally lifts a bolt of lightning out of the air and throws it back at him. Zoom is bigger than Barry and his costume is very unsettling. Tony Todd’s vocal performance makes him sound very demonic and the casual way that he defeats Barry really dials up the threat level. Seeing him parade Barry around the Picture News office and the Police Station sends a powerful message to Central City that their hero is worthless against Zoom. Leaving Barry unable to feel his legs gives him more reason to be scared. Any concerns over Zoom being a retread of Reverse Flash are gone after this powerful display. There are no clues as to his identity but one theory is that he could be Earth-2 Barry. My favourite theory is that he is the Earth-2 version of Henry Allen/ There’s no evidence to support or counter this at this point so his identity is entirely up for debate. It’s far too early to be dropping significant clues but more information will definitely be coming. An excellent episode that introduces Zoom as a terrifying threat that Barry and the rest of Team Flash are nowhere near ready to face. 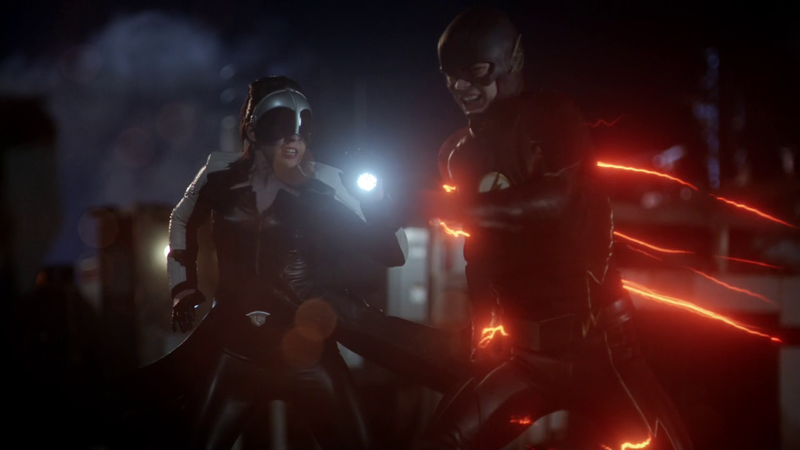 The bulk of the episode is kept light with the focus being on training Earth-1 Linda Park to pose as her Earth-2 counterpart in order to lure Zoom into a trap. The episode doesn’t gloss over the fact that Linda is completely overwhelmed by the situation as she is a normal person with limited exposure to these sorts of things. She is also terrified as she is putting her life in real danger. It says a lot about her character who has always been established as confident that she is willing to put her trust in the Flash and do what she can to help him stop Zoom. 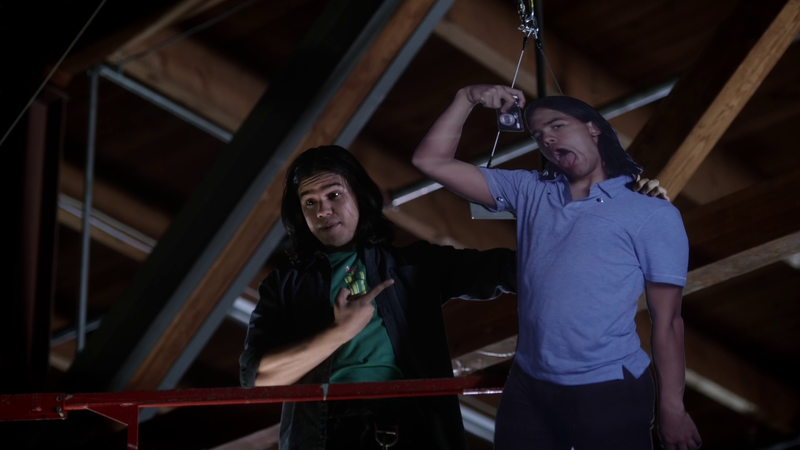 I loved the training scene mostly due to Cisco’s hilarious poses in the various cardboard cutouts. Joe was also a lot of fun in this scene. When this show decides to have fun it really is infectious. Barry revealing his identity to Linda is something that doesn’t really work. The sentiment of promoting mutual trust between them is fine as a motivation but Barry shouldn’t be so cavalier with his identity. Iris would have every right to be annoyed at him taking so long with her but unmasking in front of Linda far more quickly. The fake fight between Linda and Barry was really cheesy but a lot of fun. Their hammy dialogue was probably a big part of the reason that Zoom didn’t take the bait other than the fact that it was so obviously a trap. Harry’s motivation becomes known to Team Flash through Cisco managing to “vibe” him. I do wonder why Harry didn’t bother to tell Team Flash that his daughter had been kidnapped and he needed their help. It would have prevented some of the mistrust and motivated them to want to help. The flashback scenes in Earth-2 weren’t completely necessary but it is always fun to see Earth-2 and it does allow a better look at Jesse as well as hinting that her relationship with her father has a bit of an edge. There is some exploration of Barry’s motivation through Joe. Joe thinks that Barry is obsessed with stopping Zoom because he didn’t directly get to stop Reverse Flash and needs that revenge. Barry admits that it is more about what Wells said in his confession. It is pointed out that Barry will never be happy even if he gets what he wants and it’s something that stuck with him. To Barry it is also about saving the innocents that Zoom is carelessly putting in danger as that is what Barry is all about. Joe tells him to stop stressing and go after what makes him happy. This causes him to really make a go of it with Patty who is managing to be a lot more than a love interest for Barry. Her intelligence makes it easy for her to figure out when Joe is being evasive and she happily calls him out on it despite Joe still not caving. She is a welcome presence on the show and actually feels like a character. Zoom’s full introduction leaves a lasting impression as he easily defeats Barry and shows that he is far more powerful. His ability to catch lightning out of the air and throw it back at Barry is a clear example of this. 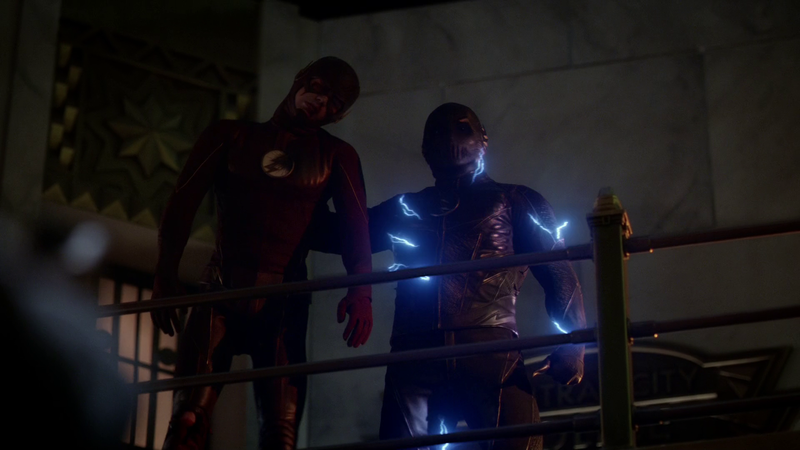 Zoom is bigger than Barry and his costume is very unsettling. Tony Todd’s vocal performance is almost demonic and his casual defeat of Barry really dials up the threat level. Seeing him parade Barry around the city to show how useless their hero is sends a powerful message that he is a significant threat. 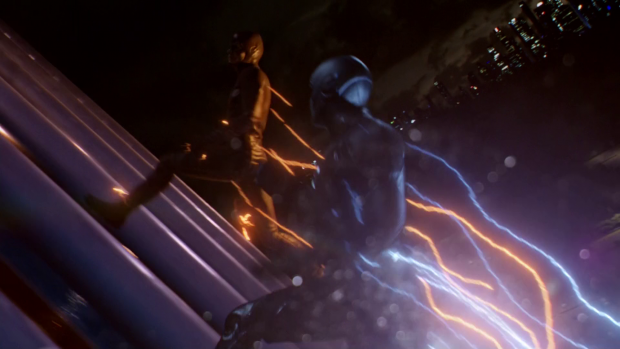 Any concerns that Zoom would be a retread of Reverse Flash are completely gone after this powerful display.